Common Snakes of Texas: If you wanted a state with a little bit of everything to offer, Texas would be the place to come to. There’s plenty of desert here which, let’s face it, we’ve all come to associate with snakes, and on top of that there’s a rich and diverse series of habitats to provide the perfect home for a number of snake species. When you combine that with a subtropical climate over the majority of the state and you have yourself a winning combination of ingredients which was bound to attract a number of slithery visitors. According to scientists, there are over 100 different snakes found in the state of Texas but the good news is only 15 of those are venomous. Another little statistic for you - only one out of every 500 snake bites will result in death. That’s 0.2% in case you wanted to know. In the state of Texas, 1 or 2 people die every year as a result of a snake bite from a venomous snake. Click here for a list of Venomous Snakes of Texas. Garter Snakes: You’ll find both the Redstripe Ribbon Snake and the Western Ribbon Snake are common snakes of Texas, relatives of the Garter Snake, another one commonly found. The Checkered Garter Snake has quite the striking design although they’re small snakes so if you blink, you might just miss them. Texas Ratsnake: A relatively large snake in comparison to some that we have mentioned, the Texas ratsnake can grow to five feet and more in length, with a tan or yellow coloration with unorganized and irregular patches of darker color along the length. These snakes, although mild-tempered, can lash out when threatened or disrupted with the younger adults being more likely to snap than their cooler, calmer and older counterparts. You may also spot the Great Plains Rat Snake. Eastern Hognose: A snake that is actually very common across America, the eastern hognose snake is one that grows to about 30 inches long, will display venomous-snake-like behavior when threatened but is actually harmless. 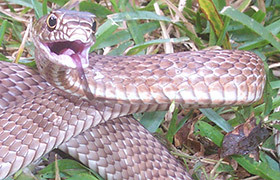 When cornered, it will coil up and flatten its head to look like a cobra but it takes a lot to agitate this species. Coachwhip : Both the Western Coachwhip and the Eastern Coachwhip are common snakes of Texas, long and slender snakes with small heads and big eyes. 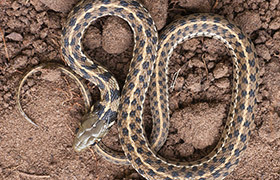 If you live close to prairies, pine forests, moist sand and soil or large open and grassy fields, you may spot one of these snakes on the hunt for rodents, lizards and even small birds. Ringneck Snake: The ring-necked or ringneck snake is another harmless species, nocturnal and secretive so another that you probably won’t see. It is very rare that you’ll see this snake during daylight hours, especially around highly populated areas although they do eat common bak-yard bugs such as earthworms as well as slugs and snails. Although it looks a little like the coral, a snake that is actually very venomous and highly toxic to humans, the California king snake is actually pretty harmless and although it’ll attack if you corner or threaten it, when you leave it alone it’ll be more likely to slither away. Its main form of defense is a shaking tail which sounds very rattlesnake-like. 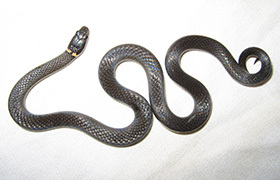 A constrictor, the California king snake eats a diverse diet making it well adapted to many regions within Texas. From small mammals to eggs, lizards, small birds, rodents like rats and mice, small snakes (including venomous rattlesnakes), salamanders, frogs and more, you can see how and where this snake will find its food source, and how that means it’s often found in residential areas. You’ll find a couple of water snakes in Texas including the blotched watersnake and the Diamondback Watersnake, a very common snake in Texas often found along the edges of fast-running water such as streams and lakes. 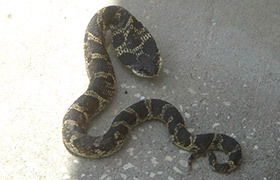 Not to be confused the diamondback rattlesnake - the water snake is harmless when left alone. A snake that eats things like mice, rats and other small rodents (rabbits), as well as lizards, frogs and toads, the bull snake is very well adapted to a number of different habitats, making it a popular one in both quiet and human-populated areas, especially where there’s plenty of waste to attract rats. This snake also helps to keep venomous rattlesnake numbers down. If you don’t like spiders, you’ll like the Texas brown snake, one that eats many of the bugs you don't like - spiders, slugs, earthworms, crickets, small frogs and other insects. 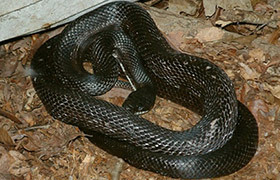 You’ll find this small snake hiding in bark and under logs or log piles, and if you take a peek in your flower beds, you may even spot one of them there. There are a number of lined snakes in the family and you;ll find them wherever you’ll find moist and soft ground such as soil and sand, so grasslands and the outskirts of marshlands and swamps are a great place to start. Their main food source is earthworms so you’ll find the snake where you’ll usually find earthworms and sometimes this means right out in your back yard. Just as the name would suggest, Graham’s crayfish snake eats crayfish and for that, it needs to inhabit places around crayfish, therefore water. Streams and rivers are a good place to start looking, but keep your eyes peeled, it’s a fast moving and fast swimming snake that will wash off if alarmed.